It seems a candy being sold in Quebec, Canada has been pulled from shelves after they prompted a racism complaint before the province’s human rights tribunal. Sloche has agreed to donate $18,000 to a Montreal group for black youth and destory it’s remaining inventory of $12,500 worth of candy. 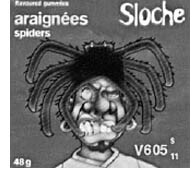 The gummi spiders were sold by Sloche in a bag that shows a scowling black face with a crooked mouth, a gold tooth, and dreadlocks in the shape of a spider. A picture of the bag is seen above – unfortunately, the picture’s not very good, but it’s the best picture I could find on the web. 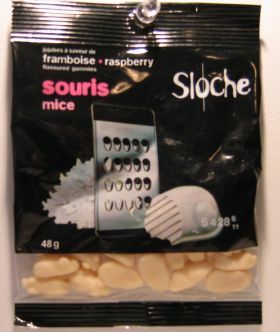 Now here’s the really interesting news to me: Sloche is actually known for pushing the limits with their candy packages. Here is a great site that shows some of their really weird, odd, and even gross candy packages. Their wrappers show gummi bears drowning on fishhooks, gummi bears being killed by cars, mice being grated (seen below), and frogs being dissected. Wow. I want some of those packages! Anyone in Quebec want to hook me up? Hey, whoever wrote this article, if you really want some of that candy, just e-mail me, I’m from Quebec. I’ve already seen these wrappers, and honestley, considering the other wrappers of this company, I don’t think this should qualify for racism. The company originally made beverages (slush) but they decided to start making candy with the same taste as their slushes.